The Belgian Princess Elisabeth base installed at Utsteinen, Antarctica, has been officially inaugurated in February 2009. This base will host scientists and various instruments. One of its objectives is to improve our understanding of climate-related mechanisms, a first step in the fight against climate change. The Royal Observatory of Belgium (ROB) was involved in the first season of scientific missions 2008-2009. In February 2009, the ROB installed two permanent high precision GPS (Global Positioning System) stations, called "ELIS" (ELISabeth, Belgium station) and « ULUX » (Utsteinen LUXemburg, Luxemburg station). The continuous measurement of the position of these stations will allow the ROB to estimate the horizontal and vertical deformation of the Earth surface over time with a precision of one millimeter per year. Why do we need GPS stations in Antarctica ? The huge mass of glaciers deforms the Earth's crust. This is the case of the Antarctic continent, which is deforming slowly due to large amounts of ice melting at the end of the last ice age, 12 000 years ago. 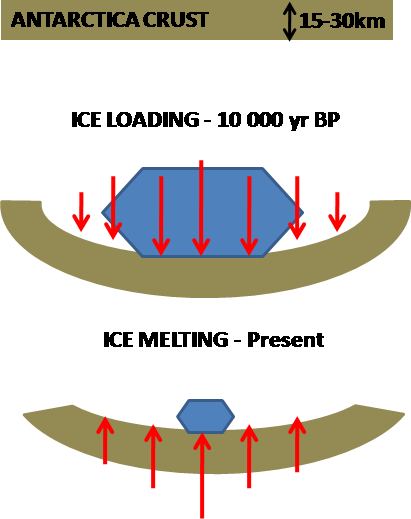 On the other hand, there is a faster deformation caused by variations of current glaciers, caused by global warming. To separate these two components of the deformation, it is necessary to combine measurements of surface deformation from GPS data with measurements of gravity variations using an absolute gravimeter. This is the aim of the GIANT project (Geodesy for Ice in Antarctica), lead by the ROB and the University of Luxembourg. From the next austral summer, the ROB will proceed to an annual gravity measurement campaign, in collaboration with the University of Luxembourg. Another use of GPS data will be to better understand the physics of the atmosphere in this region of the globe, thanks to the atmospheric parameters measured by GPS (quantity of water vapor in the atmosphere and electron density of the ionosphere). 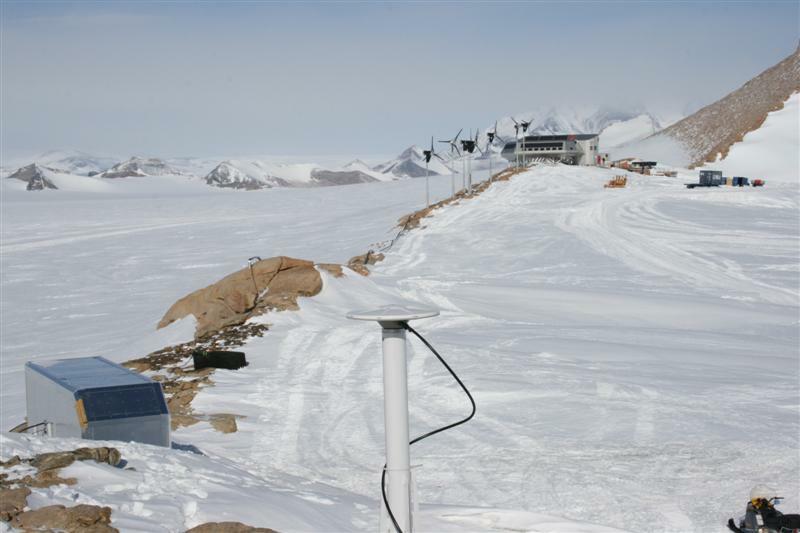 Finally, the global distribution of GPS stations remains poor on the Antarctic continent, because of extreme conditions, random and expensive communications and difficult access. 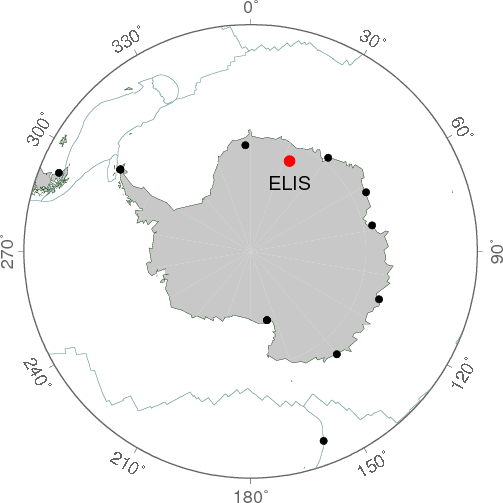 The installation of "ELIS" and "ULUX" will densify, at the South Pole, the global network of permanent GPS stations used to determine the global coordinate system. To install the GPS stations, the Department CISS (Department Communication, Information System & Sensors) from the Royal Military Academy has developed, in collaboration with the Observatory, a system tailored to the extreme conditions of Antarctica. The system allows also the smooth download of the ELIS GPS data to Belgium where they will be analyzed by scientists of the ROB. The GPS receiver of the station "ELIS is also Belgian as it has been provided by the Septentrio (Leuven). One scientist form the ROB stayed 12 days at the Princess Elisabeth station to install the geodetic points. The GPS antennas are situated 20m north the shelter for ELIS and 35m for ULUX. The distance between the two antennas is 15m. One of the main difficulties was to find an apparently stable part of the ridge, composed of many granitic blocks, to install the GPS antenna and to be sure to measure crust deformation and not bloc instability. Four days (15/02/2009 to 18/02/2009) of continuous data were acquired, each 1s and 30s for ELIS and ULUX GPS station respectively. The 4 days of continuous data have been processed to quantify the repeatability of the estimated positioning and estimate the capability of those GPS stations to estimate atmospheric parameters. For that purpose, 7 continuous GPS stations in Antarctica were also integrate to process the data in a network approach. We estimated the position and its precision for the two stations. The mean position estimated during the 4 days are in latitude, longitude and altitude: S71°56'48.1; E23°20'46.8; 1389.8m for the ELIS station and S71°56'47.7; E23°20'46.2; 1389.8m for the ULUX station. Those positions vary during the 4 days by 1.9 mm on the East component, 3.2 mm on the North component and by 4.2 mm on the vertical component. The variations of the position due to tectonics are negligible during 4 days. Consequently, the variation in the coordinates during this period is only due to the mismodellings during the GPS data processing (atmospheric loading, solid tides, atmospheric refraction or GPS orbits) and reflects the precision we can obtain at the moment in such region. The tropospheric parameter estimated from GPS data is the Zenithal Total Delay (ZTD) which corresponds to the delay of the GPS signal at zenith due to the tropospheric refraction when the GPS signal traverses the troposphere. The ZTD can be converted in terms of water vapor content in the troposphere (1 mm ZTD = 0.15 mm/m2 of water). Due to the close localization of ELIS and ULUX stations, the ZTD estimated must be the same. 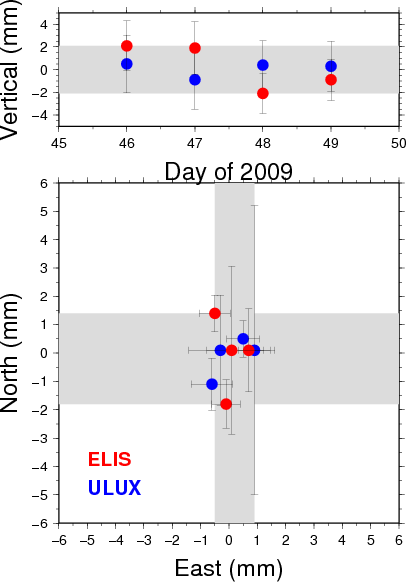 Consequently, we estimated hourly ZTD from the ELIS and ULUX data during the 4 days of continuous data acquisition. 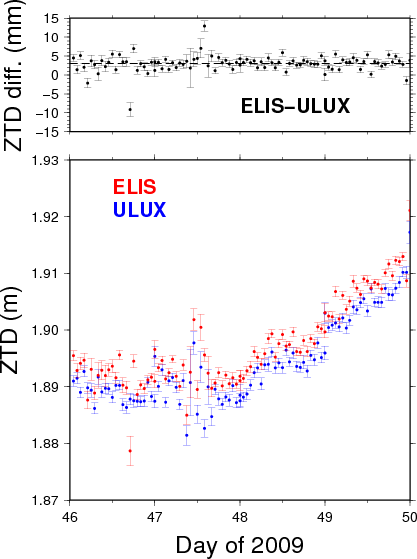 The ZTD time series from ELIS and ULUX stations are in good agreement with a mean difference of 3 mm and a maximum difference of 13 mm. Those estimations encouraging us to use GPS to monitoring the Antarctic troposphere for meteorological applications (the required precision for meteorological prediction is 3-10 mm of precision on the ZTD) and in the future for climatological studies. The ionospheric parameter estimated from GPS data is the Total Electron Content (TEC) which is the ionization state of the upper part of the atmosphere due to solar radiation. At the first order, the TEC is dependant of the Solar exposition of the ionosphere. Additionally, the TEC varies with respect to Solar eruptions and induced geomagnetic storm or seismic waves propagation. We estimated the ionospheric TEC above the two GPS stations and found a diurnal variation of this parameter due to the exposition of the ionosphere to the Sun. 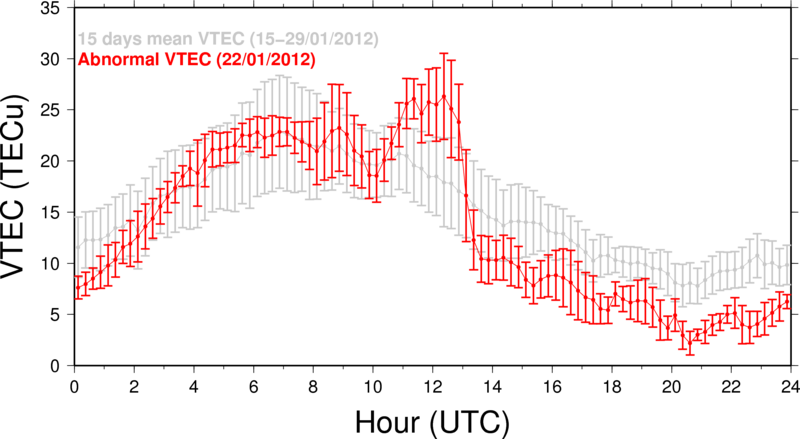 The VTEC estimated from Antarctica IGS stations + ELIS data shows differences of 1.5±0.9 TECU with Global ionospheric Maps from CODE IGS analysis center. This result is a first step to better understand the physics of the ionosphere in the polar region.